It's the eve of the 22nd century: a world where the dearly departed send postcards back from Heaven and evangelicals make scientific breakthroughs by speaking in tongues; where genetically engineered vampires solve problems intractable to baseline humans. And it's all under surveillance by an alien presence. Daniel Bruks is a field biologist in a world where biology has turned computational. He's turned his back on humanity, but awakens one night to find himself at the center of a storm that will turn all of history inside-out. He's trapped on a ship bound for the center of the solar system. A vampire and its entourage of zombie bodyguards lurk in the shadows behind. And dead ahead, a handful of rapture-stricken monks takes them all to a meeting with something they will only call The Angels of the Asteroids. 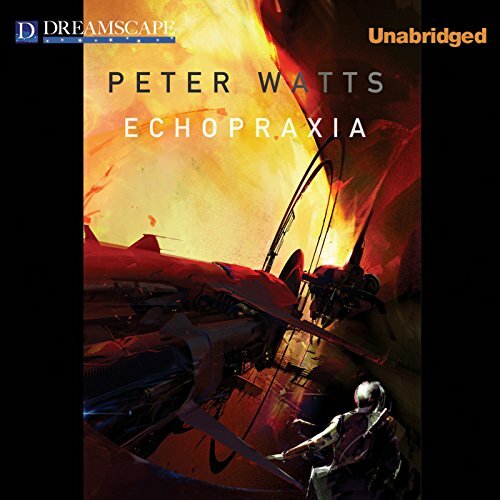 Having read what a few of the other reviewers had to say about Echopraxia, I begin to wonder if we've listened to the same book. Let me begin by saying that I listened to Echopraxia before I ever heard of Blindsight, and I don't feel I've suffered from getting them out of order. They are both fine books. Adam J. 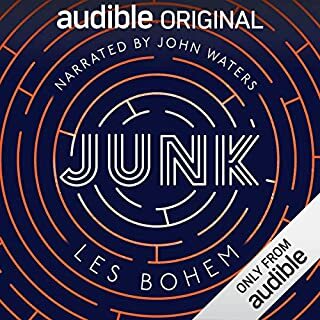 Rough isn't the best narrator I've listened to, but he's far from the worst. In any case, he seems to have been selected beautifully for this role. I don't believe that this book intends to make a value judgement about religion or science or their respective roles. These are important themes in the book, and they are thoroughly explored. But this book isn't preaching to anyone, and its not trying to convince you of anything. This book is what science fiction was meant to be. This book inspired in me a feeling of awe that I had believed lost in the passage from childhood. The quality of ideas explored in this novel is the standard to which I will hold all future readings. 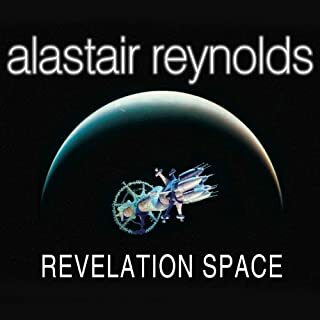 Although this novel is set in the same universe as Blindsight, it is not a thematic sequel. There is some character overlap, and Echopraxia does deal with some of the story elements of the earlier novel. 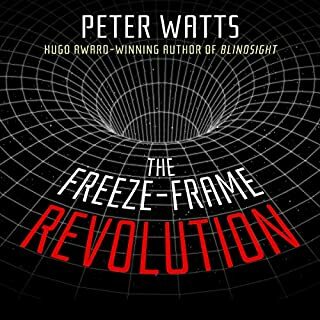 The author Peter Watts explains in the afterward that he was attempting something that many think an oxymoron: a faith-based Hard Science Fiction novel. In so doing he was not sure if he would be performing a complete face-plant. I think Echopraxia was successful. I appreciate the manner in which it portrays people with religious faith as intelligent. He even manages to let these spiritual characters get in a few good arguments against materialistic evolution. Here Watts is going against the mainstream in Science Fiction where intelligent design is routinely mocked and materialistic, atheistic evolution is habitually lauded. I found the author’s afterwards to be thought-provoking and entertaining. In one section Watts explains his argument against free-will based on the cause-and-effect relationship for the central nervous system. 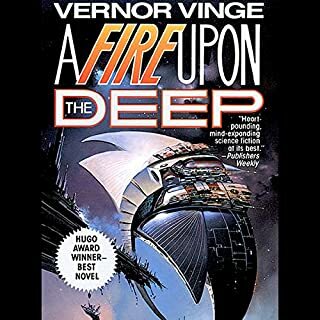 This should be read by anyone interested in religion in Science Fiction. It will certainly advance the discussion in the arena of ideas. Adam J. Rough does fine work as the narrator. I found that his female voices were first rate. He handles this primarily with subtle inflection and changes in pacing. I've loved the majority of Watts' writing because of its tone and the fact that I feel smarter after reading through any of his offerings. He's got monsters and aliens you can believe in along with a brutally well thought out plan for humanity. With that said, he's not selling you a bright future. It's fascinating, engaging, and believable when you think about what he's put on the table (and you will think about it) but it is in no way a future you want to experience even as you finish the book with feels of dread that you'll see some of this in your lifetime. Can't recommend his writing enough, just make sure you start with Blindsight and not here. It's OK but it's not Blindsight. Interesting as expected but a bit of a slog to get through. Why? The story doesn't flow and isn't as interesting as Blindsight. There's a lot of dialogue, not much action. Also, I never became a fan of the lead character. He was a wimp and dim-witted at times which I know is a point of the story, but readers want someone smart and strong (like themselves) to root for. A hero. On the plus side, there are a number of ideas to make you think about what may be possible with biology. Narration: I wonder how much my opinion of the book was affected by Adam Rough. While Adam is not bad, I do not like his character voices, and I do not think he read parts of the book with the tone and inflection I would imagine Peter Watts wrote them. Too bad. I am really looking to book 3. The world that he makes seems like something that could come to pass, vampires notwithstanding. A speculation of speculations on the human mind? 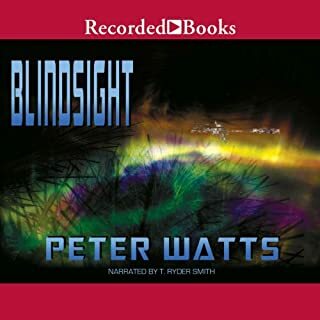 Both Blindsight and this book use the arrival/discovery of an alien intelligence as the vehicle to speculate on what the future human mind may become based on an assumed nature and speculated human intervention. Religion and freewill seems to get most of the author's attention. 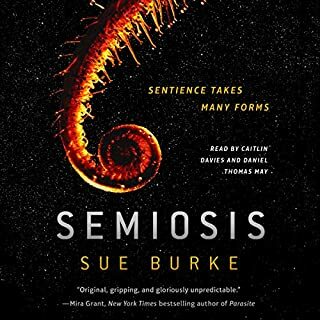 If I had known this up front, I would have enjoyed these books more as I expected more in the way of human/alien interaction. My A hearing of the very last chapter of this work before starting is valuable toward contextual understanding. I listened to it last. Answers to questions about the alien born by Blindsight are not forthcoming here. Seems like the book illustrates, thus promotes Watt's apparent worldview of a deterministic existence with little or no meaning. Such has value as it provides details on the current state of such thought. Fine for him to do that but in my opinion, the logical case for a Christian God is has a strength far beyond anything the determimistic athiest can present. Perhaps this book represents a cross section of the Athiest' s ongoing search for "No God." Regardless, I found both books very frustrating as I experienced much unrequitted curiosity as questions I thought were posed went unanswered. Reading that last section first would have been very helpful (for Blindsight as well). Finally, the book seemed to go through too many extraneous, repetitive cycles on what had already been presented. Perhaps a novella is a better vehicle here? My only motivation to finish was my hope that this will be a trilogy and that the next book will be on par with Blindsight. Interesting ideas, but characters and story lacked. On a more positive note: The post-script was really enjoyable. Kind of wish the whole book was in that format. Why do authors feel the need to be so vulgar? The vulgarity distracts from the story which was confusing enough without it.